This drawing was made by Don Rosa in 1997, especially for the French "Picsou Magazine" # 311, for $crooge McDuck's 50 years. It is a drawing of all of Scrooge's appearances before he has his normal looking. A story that uses panels from "Christmas on Bear Mountain" is"The Richest Duck in the World" (D 93488). 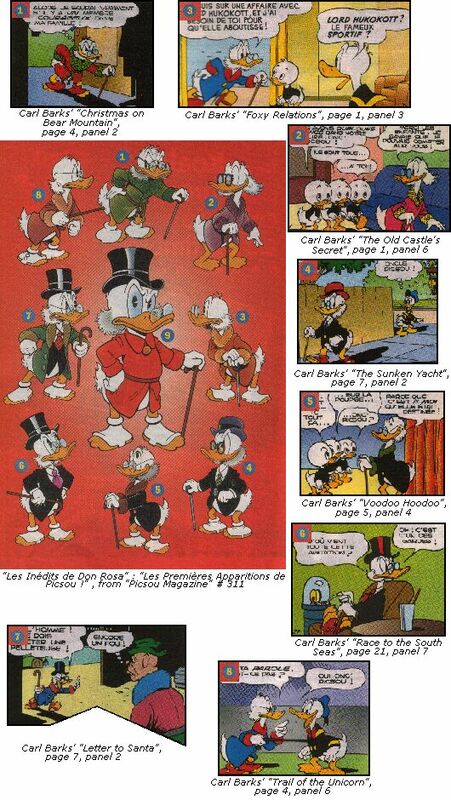 Panels from "The Old Castle's Secret" are used in "His Majesty, McDuck" (AR 145),"The Last of the Clan McDuck" (D 91308), "The New Laird Of Castle McDuck" (D 92191), and "The Billionaire of Dismal Downs" (D 93121). Other stories that uses panels from "Trail of the Unicorn" are "The Crocodile Collector" (AR 125), and "Mythological Menagerie" (AR 104). Panels from "Voodoo Hoodoo" are used in "Give Unto Others" (H 87178), and "Voodoo Hoodoo" : "Give Unto Others" (H 87178). Another drawing uses panels from "Letter to Santa" : "Les Inédits de Don Rosa #8".